Evolv is delighted to offer you Bush Flower Love System face and body treatments products – all the way from Australia. The award-winning treatments are a powerful skin, body, and emotional care system. Remember, you only have one physical body in this life. This body is your temple. Australian Bush Flower Love System treatments allow you to to love it, respect it, nurture it, and connect it to your Higher Self. They let you cover it with beautiful organic botanicals, plant butters, exotic oils, herbs and essences from some of the world’s oldest and most unique Australian bush flowers in existence. They are truly unique formulations for truly unique individuals. The Australian Bush Flower Love System is a prescriptive approach to skincare. You choose the formulation that best reflects your emotional landscape on the day you need it. Australian Bush Flower Essences have been used by practitioners for over 25 years to manage an individual’s emotional landscape. The Bush Flower Love System is the world’s first skincare system that treats skin and beauty issues in the higher and lower self holistically. The manufacturers have been researching Alpine Rose Stem Cells that grow at high altitudes. Their leaves have adapted to cold, dryness and UV, so they can resist these harsh environmental conditions and fast changes. Environmental changes and aging impair the skin barrier leading to a drier, more fragile skin and accelerated aging. • Preserve the activity of epidermal stem cells. • Protect them from environmental stress. Put simply, Rose Stem Cells are a profoundly protective, anti-ageing and skin nurturing active ingredient. 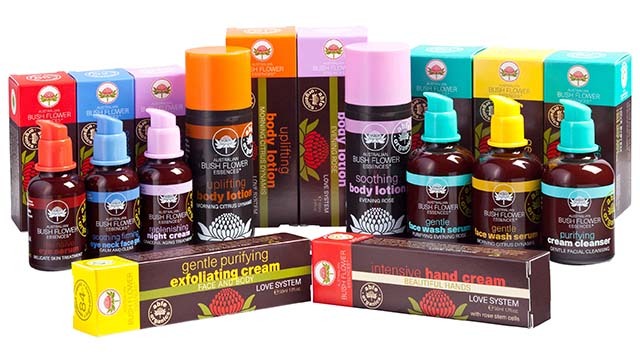 At Evolv, we stock and extensive range of Australian Bush Flower Love System treatments. We can give you expert advice on the best treatments to suit your needs, and how a range of the products can work beautifully together. Just call to see us to learn more. We’re open at 2 Castle Hill, Enniscorthy, Co. Wexford, from 9.30 a.m. to 6 p.m. each day, Monday to Saturday.